The most concise and streamlined textbook available on organic chemistry for the pharmacy student Organic Chemistry for Pharmacy is a textbook written specifically for the students taking the required Organic/Medical Pharmacy course. Using a building-block approach, the book delivers a basic, yet thorough discussion of the mode of action, therapeutic applications, and limitations of various pharmaceutical agents. Organic Chemistry for Pharmacy is especially written for students who have a limited background in chemistry. In order to make the learning/teaching experience as efficient as possible, Organic Chemistry for Pharmacy includes outstanding pedagogical features such as chapter outlines, chapter summaries, boxed “take away points”, quick-reference tables, and problems within each chapter. 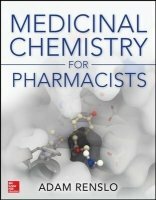 The focus and presentation of this text is particularly suited for Organic/Medical Pharmacy courses which are weighted heavily towards Organic, rather than Medical Pharmacy.